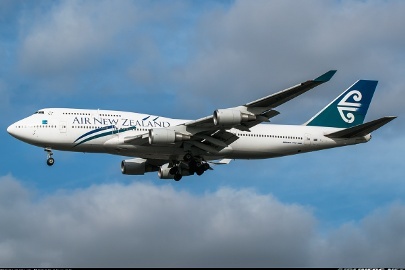 The 747-400 is the latest, longest ranging and best selling model of the 747 family. 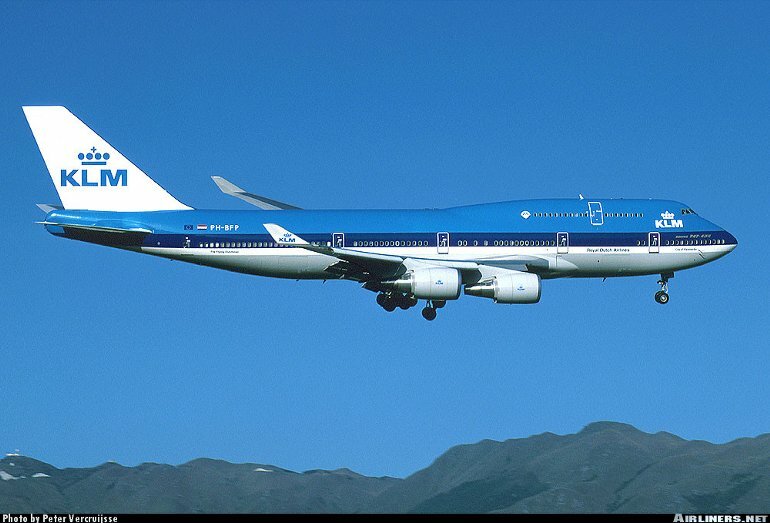 Boeing launched the 747-400 in October 1985 and the first development aircraft first flew on April 29 1988. US certification (with PW-4000s) was awarded in January 1989. 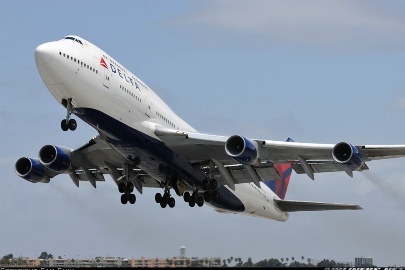 The 747-400 externally resembles the -300, but it is a significantly improved aircraft. 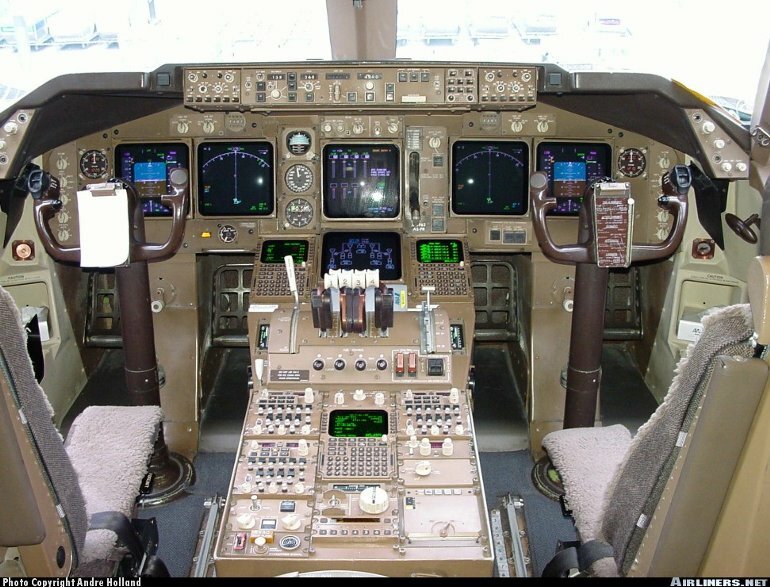 Changes include a new, two crew digital flightdeck with six large CRT displays, an increased span wing with winglets (the -400 was the first airliner to introduce winglets), new engines, recontoured wing/fuselage fairing, a new interior, lower basic but increased max takeoff weights, and greater range. Apart from the basic passenger 747-400 model, a number of variants have been offered including the winglet-less 747-400 Domestic optimised for Japanese short haul domestic sectors, the 747-400M Combi passenger/freight model, and the 747-400F Freighter (which combines the 747-200F's fuselage with the -400's wing). The latest model is the 747-400ER, which was launched on November 28, 2000 when Qantas placed an order for 6. The -400ER has the same size as the -400, but has more range or payload capability. The MTOW was increased by 15,870kg (35,000lb) to 412,770kg (910,000lb), giving a further range of 805km (435nm) or a 6800kg (15,000lb) greater payload. The -400ER also features a wholly new cabin interior with larger luggage bins, and several flight deck improvements. The -400ER incorporates the strengthened wing, body, and landing gear of the -400F, plus an auxiliary fuel tank in the forward cargo hold, and an optional second one. Operators who don't need these can remove them both, gaining additional cargo volume. The first 747-400ER was rolled out in June 2002, and flew for the first time on July 31, 2002, and this was the 1308th 747 to fly. A cargo version, the 747-400ERF, followed the standard -400ER, and was launched April 30, 2001 on an order by leasing company ILFC for 5. The first -400ERF is the 1315th 747 built. The -ERF has the same MTOW as the -ER, and this will give an extra range of 970km (525nm), or an extra payload of 9980kg (22,000lb) at MTOW compared with the standard -400F. Shortly before delivery of the first -400ER, Boeing had received orders for 15 ER/ERFs from 5 customers. Various growth 747 models have been studied. 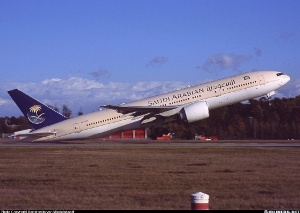 The 747-500X and -600X models were dropped in January 1997. Boeing is currently proposing the 747-400XQLR (Quiet Longer Range) to 747-size customers which will offer more range, more quiet, and more features. Four 252.4kN (56,750lb) Pratt & Whitney PW-4056 turbofans or 266.9kN (60,000lb) PW-4060s, or 275.8kN (62,000lb) PW-4062s, 252.4kN (56,750lb) General Electric CF6-80-C2B1Fs or 273.6kN (61,500lb) CF6-80-C2B1F1s or -80-C2B7Fs, or 258.0kN (58,000lb) RollsRoyce RB-211-524G or -524Hs, or 262.4 to 266.9kN (59 to 60,000lb) RB-211-524G/H-Ts. 747-400 - Max cruising speed 939km/h (507kt), long range cruising speed 907km/h (490kt). Design range with 420 three class pax at 396,895kg (875,000lb) MTOW 13,491km (7284nm) with PW-4000s, 13,444km (7259nm) with GEs, 13,214km (7135nm) with RB-211s. 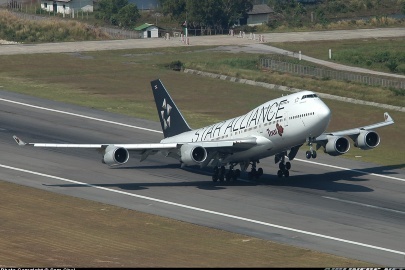 747-400ER - Range at MTOW 14,205km (7670nm). 747-400ERF - Range at MTOW 9200km (4970nm). 747-400 - Standard operating empty with PW-4056s 180,985kg (399,000lb), with CF6-80-C2B1Fs 180,755kg (398,500lb), with RB-211s 181,755kg (400,700lb); operating weights at optional MTOW with PW-4056s 181,485kg (400,100lb), with CF6-80-C2B1Fs 181,255kg (399,600lb), with RB-211s 182,255kg (401,800lb). Max takeoff 362,875kg (800,000lb), or optionally 377,845kg (833,000lb), or 385,555kg (850,000lb), or 396,895kg (875,000lb). 747-400ER/ERF - MTOW 412,770kg (910,000lb). 747-400 - Flightcrew of two. 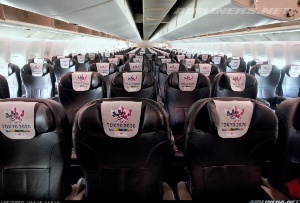 Typical three class seating for 416 (23 first, 78 business and 315 economy class pax). Cargo hold 170.5m3 (6025cuft) or 151m3 (5332cuft). 747-400 Domestic - Two class seating for 568 (24 first and 544 economy). 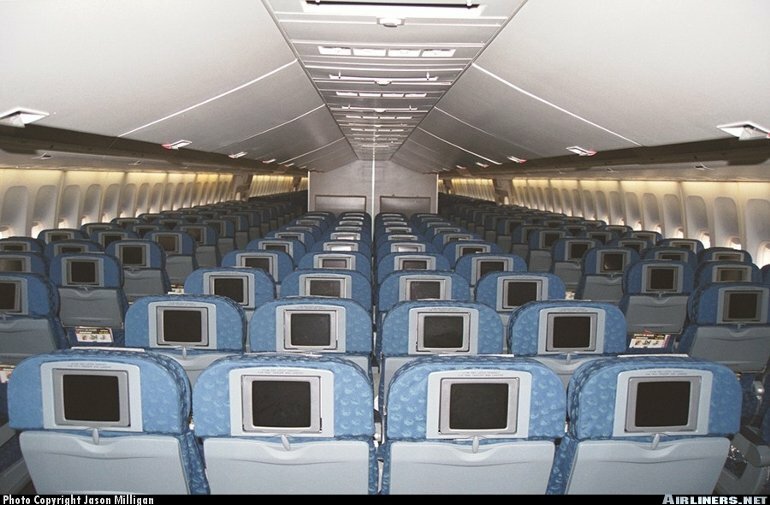 747-400 Combi - Typical arrangement for six or seven pallets and 266 three class passengers. 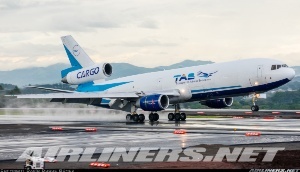 747-400ER - Same as -400, but cargo hold 158.6m3 (5599cuft) or 137m3 (4837cuft). 747-400F - 30 pallets on the main deck and 32 LD1 containers in the lower hold. 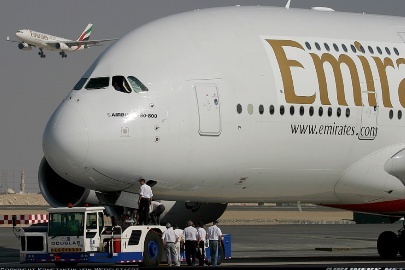 Orders for the 747-400 as of August 2002 stood at 632 (of which 17 ER/ERF), of which 585 had been delivered. Total 747 sales stood at 1356.